Marlow's Service Center is a family-owned and operated auto repair shop providing full-service automotive repair and maintenance in Cache, OK. We’ve delivered high quality work since 1957, becoming a trusted fixture in the community. Our technicians possess the skills and equipment to get your vehicle running perfectly, and keep it that way. When you come to our shop you’ll experience what our loyal customers already know: we consistently provide excellent service and repairs you can count on. Our mission is to continue building on our strong reputation for expert and timely repairs and maintenance. You can expect quality workmanship from our technicians. We’ll get the job done right the first time at a fair price, and we’re always ready to handle any challenge arising from an auto repair or maintenance issue. Our shop is located in Cache, OK near Goodyear Tire, Bar S, and Republic Paper. In addition to Cache, our customers come from Lawton, Indiahoma, Meers, Snyder, Chattanoga, Duncan, Elgin, Altus, and Fredrick. We’re also close to Cameron College, making our shop a great resource for students in need of auto repairs and vehicle maintenance. 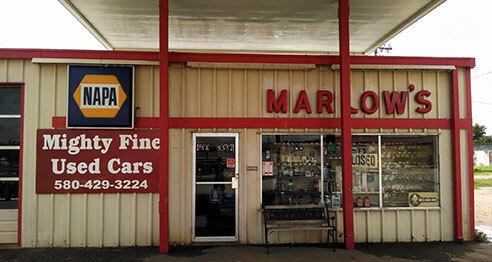 Marlow's Service Center has been a Cache area business for a long time, so we’re deeply involved in the community, including the CCIA of Cache, the Chamber of Commerce, the Lawton Antique Car Club, IMCA, and the Masonic Lodge. Our service manager, Mitch Marlow, also coaches T-ball. Call Us for All of Your Automotive Needs! Come see why Marlow's Service Center has been in business for over 45 years. Give us a call or make an appointment online today! We’re confident we can make you one of our many satisfied customers. Need to tow your vehicle? Give us a call! Serving Cache, Lawton, Indiahoma, Meers, Snyder, Chattanoga, Duncan, Elgin, Altus, and surrounding areas.